From the polar vortex in the US, to raging fires in Australia and storms and flooding racking the UK, extreme weather events have made news across the world in recent months as climate change begins to make itself felt. Though it hasn’t hit the headlines, Honduras has had its fair share of extreme weather too. The polar vortex in the US meant extra strong winter storms in Honduras, which carried on into what should have been the start of the dry season. 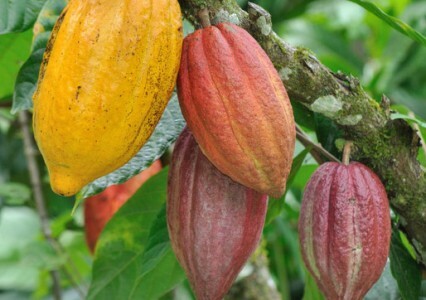 As a result, much of the bean crop sown by subsistence farmers, at what should have been the just right moment of the year, rotted in the ground before it could germinate. 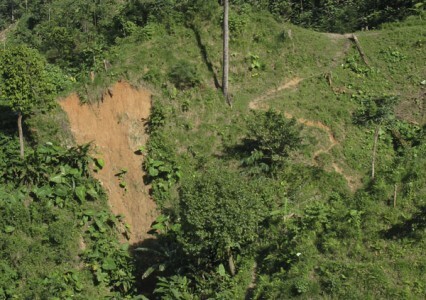 What’s more, the heavy rain has caused large numbers of landslips on the steep, marginal land which is all most Honduran families have access to, resulting in large losses of topsoil. Now, just as farming families are struggling to overcome these set-backs from the relentless rains, they look to be about to face the exact opposite problem, as predictions point to an extremely hot and harsh dry season in the coming months. Climate change looks set to make extreme weather the new normal, meaning more floods and more drought and much less of what we currently know as the norm; that is to say, something in between these extremes that allows the possibility of getting in a decent harvest. Whatever action is taken to lower carbon emission, we’re now guaranteed to see at least a moderate level of climate change, meaning agriculture will need to adapt as best it can. While it can’t provide all the answers, Inga alley cropping is a far better option than traditional slash and burn farming when it comes to facing the new challenges posed by an altered, more volatile climate. In the Inga alley system, the ground is always covered by a thick layer of leaf litter or mulch. This mulch protects the soil from direct sunlight, reducing evaporation and maintaining soil moisture even during prolonged dry periods. Compared to traditional slash and burn agriculture, Inga alley cropping is therefore much more resilient to droughts. What’s more, taking up Inga alley cropping can also help protect local water sources. In the area of Honduras where we are working, stream flow is very strongly linked to local forest cover, with streams drying up in summer or disappearing altogether when forest is cleared. Inga alley cropping is much more efficient than slash and burn and can provide food security for a family from 2 ha rather than the average 8 ha required using slash and burn. This means land that families would otherwise have to slash and burn in order to grow enough food can now be left forested (or reforested), protecting local watercourse. Many farmers understand this connection between forest cover and water supply due to first-hand experience of the consequences. 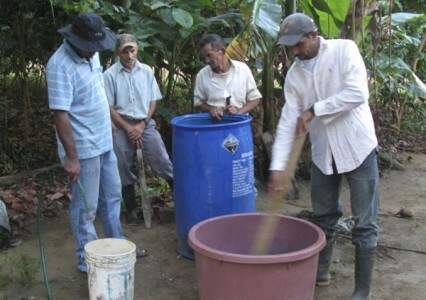 The desire to protect the water sources on their land has been a significant factor for a number of the families who have so far taken up Inga alley cropping in Honduras. 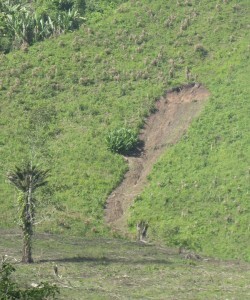 Another factor which makes the Inga alley cropping system more resilient to extreme weather is that far fewer landslips occur on land planted with Inga alleys. 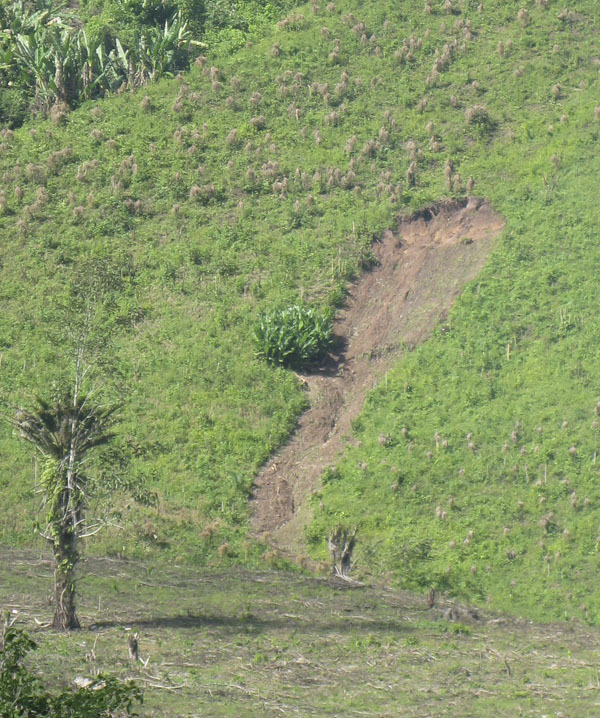 Without tree roots to bind the soil together, the extremely steeply sloping land cultivated by most Honduran families is highly vulnerable to landslides. The high density of trees (5000 per hectare) used in Inga alley cropping protects the land against erosion and landslips by binding the soil together and giving it structure. In light of the changing climate, implementing new and innovative sustainable farming techniques is all the more important. Techniques like Inga alley cropping are urgently needed to confer greater resilience against unpredictable weather events and help subsistence farmers to weather the storm.